A Waterford historian and mapmaker. [Note: Much of the Phillips Farm in now owned by the Waterford Foundation after a struggle to raise the funds for its purchase . A prosperous Quaker farmer, Thomas Phillips, began amassing land bordering the village of Waterford in the early 1800s. These lands became the Phillips farm, now in the news because of a controversy over a developer's plans to build a luxury housing development on the 144-acre site. Advocates for preservation prevailed, and the Trust for Public Land announced last week that it had signed a contract for the land. It will, in turn, sell the property to the Waterford Foundation, a nonprofit preservation organization, for $3.9 million, probably in late October. Old Wheatland Road, a 250-year-old travelway known in the 18th century as The Great Road, runs along the farm. My family and I have lived on that road since 1968. 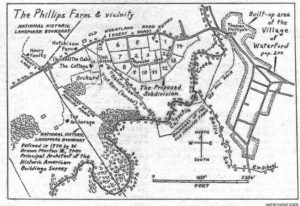 The progression through time of the Phillips farm in many ways parallels the history of agriculture in Loudoun County -- from a large farm planted in corn and wheat, to a smaller but more diversified farm, to grazing land for cattle and to land that caught the eye of a developer. "The Phillips Family," a hefty typescript compiled by the Rev. Herbert S. Turner in 1958 is my starting place. Turner's wife, Elizabeth, was a descendant of the Phillipses of Waterford, and one of his nieces, Anne Stabler Parsons of Edmond, Okla., told me of its existence a few weeks ago. She also reminded me that Turner and I had met in 1974 when I sang at her daughter Sharon's wedding. Turner was among the officiating clergy. Phillips and his wife, Rachel Taylor Phillips, named their farm Oak Grove after they married in 1801. Rachel was a granddaughter of Thomas Moore, who changed the name of the village in the early 1780s from Janney's Mill to Waterford, after his family's home city of Waterford, Ireland. Thomas and Rachel built a stone house, which still stands. It and other historic structures are located on 81 acres that will be retained by the Travis Brown family, which owned the Phillips farm before selling it to Historic Fields LLC in 2002. On the border of the property is the massive brick Waterford Mill, which Phillips had built in 1830. He owned it for two years, then devoted the last decade of his life to farming Oak Grove. He died in 1841 at age 65. Rachel died about the same age the next year. Thomas Phillips left a substantial legacy. His two-page inventory of properties listed 407 acres, $7,500 in cash and $4,900 in stock of Leesburg's Bank of the Valley, then the only bank in Loudoun County. Items of pleasure included a two-horse carriage, an eight- day clock and portraits of himself and his wife. The average farmer would have needed to work more than 30 years to achieve Phillips's wealth. After their deaths, Thomas's and Rachel's third child and only son, also named Thomas, farmed Oak Grove. In 1848, at age 35, he married Elizabeth Janney Sidwell of Winchester. She had just turned 21. In 1850, Virginia's first agricultural census recorded Oak Grove's continuing prosperity. On Phillips's 200 acres of cropland, he produced 1,000 bushels of corn, 500 of wheat and 100 of oats. Twenty tons of hay and much of the corn went to feed 11 horses, 6 dairy cows, 30 cattle and 27 sheep, which produced 65 pounds of wool. The stock, along with 35 hogs, roamed freely on an additional 290 acres. The 1860 census presented similar statistics, although Phillips now had 210 acres of cropland and 210 "unimproved" acres. As he had no children older than 11, he must have had farm help. Like most Quakers, he owned no slaves, but he may have rented them from his neighbor to the west, Sanford J. Ramey of Trevor Hill. Ramey, the only slaveholder on Old Wheatland Road, had 15 to 22 slaves of working age. 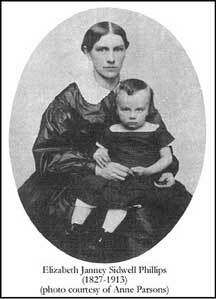 During the next four years of Civil War, Phillips's situation was summed up by an 1863 letter from Ann Sidwell to her sister, Phillips's wife: ". . . but doesn't brother Thomas get it from both sides? We were so sorry to hear of the loss of his horse, it is really too bad for him to be treated so." 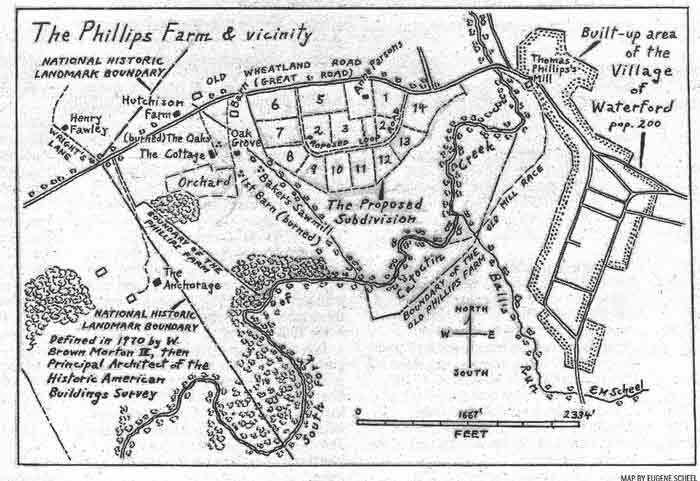 As a well-to-do farmer, Phillips was harassed by both Confederate and Union troops who wanted his produce. In early December 1864, Union soldiers burned the Oak Grove barn and drove off Phillips's livestock. Turner's manuscript quotes an undated article in the Baltimore American newspaper regarding the raid, which was ordered by Brig. Gen. Philip Sheridan to destroy providers of farm produce to Confederate partisans commanded by Lt. Col. John Mosby: "He [Mosby] is so rarely about that there is not a man in Waterford who knows him or a half-dozen of his command." This Thomas Phillips died of typhoid fever in July 1865, three months after the war ended. He was 55. The 1870 agricultural census noted that a 21-year-old son, also Thomas, ran the farm with the help of two hired laborers, who together were paid $600 a year. Crop yields approximated prewar figures, but instead of the 57 head of livestock in 1860, there were now 27. Instead of 10 horses, there were four. The 420 prewar acres of Oak Grove had shrunk to the 225 acres of today. By that time, Phillips had built the stone barn that stands today. Its steep hipped roof was lifted aloft during a tornado May 2, 1929. The tornado, Parsons told me, also uprooted most of the oaks. By 1879, Phillips had stopped farming Oak Grove. To keep the family enterprise going, his youngest brother, Arthur Willis Phillips, 20, left Swarthmore College and returned home. During his research, Turner came across an 1854 dime wrapped in a piece of paper with this note: "Dime found in plowed ground the year I first farmed. Moses Wilson was present and said, 'Boss you never ought to spend that and you will always have money.' " The note was signed "A.W. Phillips." The detailed 1880 agricultural census recorded that Phillips, like owners of many substantial Loudoun farms, had invested in farm machinery -- $1,950 worth of implements -- and in commercial orchards. Nine acres of peach and apple trees produced 145 bushels of fruit. The main crops continued to be wheat and corn, with yields exceeding those of previous years, helped by the first mention of fertilizer. Two hired hands, each of whom worked 50 weeks, received a piddling $200 apiece. Surviving production data for Oak Grove end in 1880. The 1890 agricultural census became so waterlogged after being drenched in a 1927 fire at the Commerce Department building in Washington that it had to be destroyed. Further farm-by-farm censuses were taken but were destroyed after the county totals were added. Oak Grove must have prospered, for in 1890, a year after Arthur Phillips's marriage to Letticia "Lettie" Gossling of Philadelphia, the couple moved into a new large-frame home on the farm, which during that decade took a new name, The Oaks. Shortly after 1900, Arthur Phillips had a second house built on the farm for his wife's parents, Matilda Ann and John Gossling, a retired Swarthmore College professor. Their home became known as The Cottage. Phillips became a director of Leesburg's old Loudoun National Bank and the president of Waterford Mutual Fire Insurance Co. These duties, along with age and increasing weight, often kept him from farming. On New Year's day 1926, Arthur Phillips died at 66 of a heart attack while visiting the Hamilton home of his eldest daughter, Mary Stabler. To assist her mother, Mary and her husband, Frederic Stabler, a mechanical engineer who often worked in Washington, moved to The Oaks, and Frederic became the farm's manager. Their daughter, Anne, who was born at The Oaks in 1923, recalled that her father operated a Minneapolis-Moline tractor, one of the first tractors on Old Wheatland Road. Parsons remembered when The Oaks burned on a blustery March day in 1942. "Wind sucked the fire up the chimney, and the pointing [in the brick flue] had worn away," she said. "The Leesburg fire department had two trucks, and they sent the old one. It broke down on top of the hill [Route 7 on Catoctin Mountain], so the crew had to hitchhike back to Leesburg." The new truck arrived, "but they thought the water supply was at the old pump," she said. "It was in a big tank at the bottom of the hill." The Stablers then moved into The Cottage, which Waterford builder Roy Chamberlin enlarged to its present size in 1945. That it is no longer a cottage by architectural standards is evidenced by its current rent of about $2,000 a month. JoAnn Fawley of Lovettsville told me that by 1931, her grandfather, Charles Shoemaker, farmed The Oaks for the Stablers, and in 1936, her husband David's grandfather, Edgar Fawley, became The Oaks's farmer. Both the Shoemakers and the Edgar Fawley families lived in the farm's stone house that dated to the early 19th century. Edgar Fawley, who farmed The Oaks for a percentage of the profits, sometimes receiving half of the farm's proceeds, lived at The Oaks far longer than any of its farmer-owners. His sons, Roy, always called "Jake," and Henry, assisted their father. Edgar died working in the fields in June 1975. He was 81. Parsons recalled Edgar's wife, Edith, saying: "He had to be out working on the farm. He'd been doing that since he was 7 years old." Charles and Vivian Light have lived at The Anchorage, the farm just west of the Phillips farm, since March 1948. Charles described Edgar Fawley as "one tough nut, a worker, strong as an ox." The Lights and Parsons described the farm's main crops during the 1920s through 1970s as corn for silage and wheat with an occasional field in oats and barley, the same staples nurtured by the Phillipses in the 19th century. Two new staples were hay and orchard grass, for during the mid- 20th century, more area farms were raising beef cattle. Charles Light told me that "Fawley hauled hay into Leesburg to sell on a tractor and wagon. He also rented out Rosemont [once Trevor Hill] and the Bishop farm [northeast of Waterford] for orchard grass." Parsons recalled that the thriving commercial apple and peach orchard of the late 19th century had become a parched cluster of eight or nine gnarled apple trees during her youth. She also recalled a steam-powered sawmill owned by one of the Baker builders -- probably Irvey Baker of nearby Morrisonville -- by a small stream in the rear of the farm. "As a youngster, I was astonished to see two huge oxen pulling a cart full of wood," she said. Baker, a prominent builder, was cutting up numerous trees felled by the 1929 tornado. Light remembered that the Fawleys also sold chickens, eggs and cream from The Oaks. "They fed the milk back to the cows," he said. "He [Edgar] wasn't too much in cattle." But after Fawley died, beef cattle, along with corn for silage, became the main crops at The Oaks. Francis Shoemaker, whose father, Charles, had farmed The Oaks and lived in the stone house in the early 1930s, rented the farm from 1976 though the 1980s, JoAnn Fawley told me. Other short-term renters followed. JoAnn also mentioned an earlier family connection to The Oaks: "My father said that as a youngster, he learned to swim in the mill race by the dam" in the field where his cattle ran. The race and dam had been constructed for Thomas Phillips when he had his mill built in 1830. The Oaks "had fallen into the hands of strangers" -- to quote an old Virginia adage -- in 1959, when the Phillips heirs sold their farm, then 2351/2 acres, for $65,000 to Travis T. Brown Sr., a Washington area tax lawyer, and his wife, Ann. Light said his father, J.B. Light, had bid $60,000. The Brown family continues to use the farm, calling it Point of View, as a weekend retreat. In 1957, the Phillips heirs had given Parsons 21/2 acres. Clark Baker and sons (cousins of Irvey) of Taylorstown built the one- story brick house on that land "low to the ground, hugging the hill so it wouldn't offend anybody," Parsons said. One cannot see it today, either from the road or village. Just before sale of his family's farm, Herbert Turner wrote of The Oaks in the preface of his manuscript: "But it too must now, like everything else, give way before the inevitable change that time brings." Change is a charged word in a national historic landmark.